The Champaign-Urbana Public Health District (CUPHD) today reported a local case of measles and provided a list of possible exposures. Posted on Facebook, the information regarding the sick person has gone viral, and has been shared almost 5,000 times as of Thursday evening. Although most people are vaccinated and therefore “not at high risk,” the CUPHD said, the information about the presence of measles in Champaign-Urbana sparked concern across the community. CUPHD made clear in its Facebook post that vaccinations are the most effective way to prevent measles. 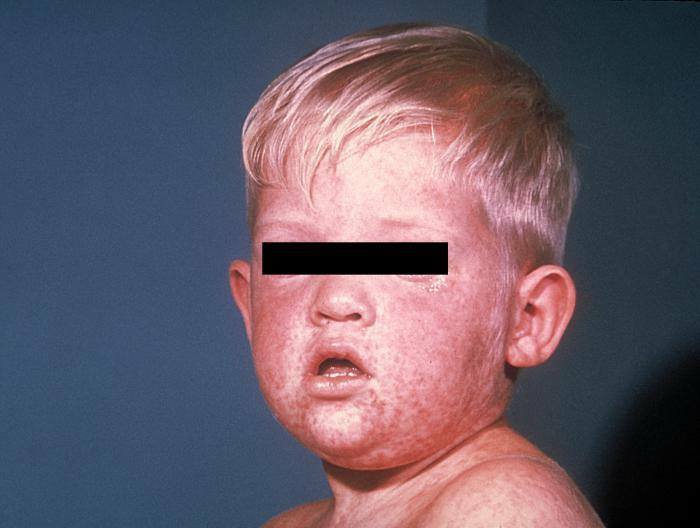 An example of a case of measles, in a stock photo from decades ago. Photo provided by Champaign-Urbana Public Health District. Symptoms of measles include rash, high fever, cough, runny nose, and red, watery eyes. If individuals develop symptoms of measles, CUPHD recommends they call their health care provider before going to a medical office or emergency department. Special arrangements can be made for evaluation while also protecting other patients and medical staff from possible infection. CUPHD did not identify its ill client. CUPHD did provide the following information about possible exposure locations and dates. NOTE: All of these places are safe to visit at this time.